Now that servers are no longer developers' problem, a multitude of other tools have been created to make computing that much easier. Serverless computing is creating revolutions in the IT industry and it is a fact that nobody can deny. 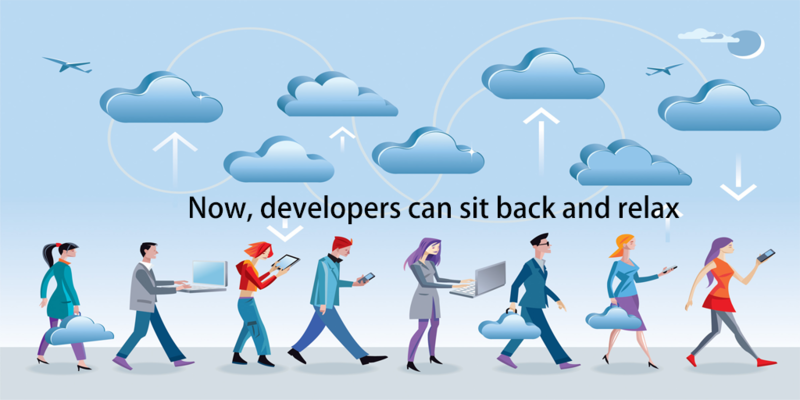 Software development has become easier than ever after the advent of serverless computing. Serverless computing has relieved software application developers from the grunt work of maintaining servers, enabling them to make more time for writing code. Besides reducing operational costs and development time, serverless computing also ensures elastic scalability. The technology is an event-based programming model and it comes with pre-installed security measures. So overall, with serverless computing, application development is not just efficient and effective, but safe, too. The term "serverless" is a bit of a misnomer. There are still servers involved, just that their administration and provisioning is hidden from the developers. It’s a higher level of abstraction and is commonly referred to as Function as a Service (FaaS). Serverless is a misnomer and it does not refer to the original nature of the technology. A server actually exists in the system but it is maintained by the cloud service providers. Since the developer doesn’t have to worry about maintaining the servers anymore, the technology gives them a feeling that a server doesn’t exist at all. There are two ways to go forward with the serverless computing technology. Developers can either deploy serverless codes in conjunction with traditional codes or alternatively write purely serverless codes. Earlier in this blog post, we discussed the cost-effectiveness of serverless computing. But how does this technology make software development pocket-friendly? The answer is serverless computing! Serverless computing is basically a utility-based computing model. In the utility computing model, the service provider charges the customer only for the specific usage instead of a flat rate. Simply put, you pay only for what you use. Conventionally, developers estimate and buy a certain amount of space and leave most of the space unused. This overestimation is done deliberately in order to avoid the capacity shortage. But with utility computing model, developers can instantly buy extra space whenever they want. Also, the biggest advantage of this computer model is that the developers don’t have to pay an initial cost in advance to avail the computer resources. Serverless computing fuelled the technologies like Function as a Service (FaaS), Backend as a Service (BaaS), and Platform as a Service (PaaS) to get off the ground. Serverless computing is actually akin to FaaS as it has functioned as its deployment unit. Since there is no need for server maintenance from the developer’s side, the functions end up being stateless. However, the functions would need backend services to ensure the required levels of abstraction. This is where Backend as a Service provider come into play. As far as PaaS, Google-born Kubernetes technology is dominating the container market. Services have given birth to a whole new startup ecosystem. Giant companies like Amazon, Alibaba, IBM, Microsoft, Google, Iron.io have launched their own cloud hosting services. AWS is one of the most popular cloud rentals that most of the companies bet on. Cloud computing has become a big business for the e-retail giant and the multicolor deployment function is becoming more popular among developers. A recent blog post in Geekwire says that Amazon Web Services are superior to its four other competitors. According to Gartner, Amazon Web services own 51% of the $12.2 billion total market revenue. Microsoft Azure is a flexible, open, enterprise application development cloud computing platform. Azure is one of the most consistent hybrid clouds in the market. Azure claims to have over 100 services with a good number of end-to-end tools. It features a bunch of AI services by virtue of which companies can create intelligent apps and incorporate machine learning. Microsoft Azure’s official website proclaims that 90% of the Fortune 500 companies run on the Microsoft Cloud. Google Cloud is the new member on the block that helps you build, innovate, and scale applications effectively on the Cloud. Google organizes an annual event called Google Cloud Next. This year, Google had its global customers giving feedback on the Cloud services and also announced its future plans for the Google cloud. Tech giants like eBay, HSBC, and GO-JEK are some of the prime customers of Google Cloud. Companies encounter an apparent change in the response time and quality after moving to the Google Cloud. For example, urban Airship witnessed an apparent boost in the notification speeds after it moved to the Google Cloud. Now, Google platform also offers a cryptographic Hardware as a Service. IBM Cloud comprises of a range of SaaS, PaaS, and IaaS (Infrastructure as a service). IBM Bluemix is a Cloud Platform as a service offered by IBM. Bluemix runs on Softlayer infrastructure and is based on Cloud Foundry. IBM also offers an application development platform called IBM Cloud Private for container applications. IBM also rolled out an approach called Blue Cloud which aims to automate the fluctuating demands of IT resources. At its core, the company aims to make it easy for developers to adopt a microservices architecture. The company has two flagship products, the first one being IronMQ, a message queue service, and the second being IronWorker, a platform to run tasks in parallel at scale. Though being a younger company, it managed to expand its customer base with over 2000 customers including Airbrake, Hotel Tonight and bleacher report. The power of serverless computing doesn’t just stop with FaaS, PaaS, and BaaS. Though these services relieve developers from the burden of managing servers, there are certain tools that can make their lives even easier. These tools, in general, minimize the time developers spend to configure the underlying infrastructure and monitoring. Here is a list of few such popular tools. Clay can instantly create an HTTPS function. It solely focuses on giving programmers a good developer experience. The editor can be offer improved debugging and provide comprehensive access to NPM packages. This will help you to store the private keys securely. LambCI is a tiny package that can be uploaded to AWS Lambda. Lamb CI is triggered whenever you push new code or even existing requests on GitHub. LambCI supports languages such as Java, Python, Go, etc. To use LambCI an AWS Account and an OAuth token is all you need as prerequisites. Node Lambda is a command line tool. Node Lambda is used to deploy (and locally run) Node.js applications on Amazon Lambda. Node Lambda was created in 2009. It's an open source project that helps JS developers to quickly share packed modules of code. Kappa is an inline command line tool. Kappa makes it simpler to update, deploy, and test functions on AWS Lambda. Kappa creates IAM execution role and the associated policies. If you want to make changes, you can quickly update the Lambda function using Kappa. Open Lambda is serverless computing platform that supports most of the leading serverless platforms. It is an open source Apache licensed project. Open Lambda is written in Go and is completely focused on Linux-based container. The platform mainly aims to facilitate sandboxing, load balancing, databases and session management. Back& is a platform on which you can run multi-cloud serverless applications. Back& provides DaaS (Database-as-a-Service), FaaS, Security-as-a-Service, and Integration-as-a-Service (do not be confused with Software as a service and Infrastructure as a service). Cloud Zero helps developers to monitor serverless systems and get necessary insights on a regular basis. This tool focuses on change management by recognizing the anomalous behavior, figuring out what changed in the system, and then discovering what (or who) is responsible for the change. As of now, Clod Zero is on its beta testing phase and will be released in late 2018. The future of serverless computing will leave its mark on big data, IoT, cognitive intelligence, and data analysis as it moves forward. According to Gartner, the technology will reach its peak by 2020 and its applications will not only be limited to the IT industry but go beyond it. Despite the numerous advantages the technology provides, it also comes with a certain drawback. The downsides may include response time latency, excessive code usage, and complex debugging. Will the advantages overshadow the downsides in the future or IT will find ways to fill these gaps? One can only ponder! Published at DZone with permission of Mohamed Sathik Ali . See the original article here.